Bangkok is a vibrant urban city in the heart of Asia; so naturally, there is a vast array of sights and activities that you can see or do as a traveler. However… if you ever find yourself with only a day to spare, don’t fret! After all, it is still possible to get a sense of what the city can offer with even just 24 hours or less. Therefore, no matter if your trip to Bangkok is just for a layover or a brief stopover, my itinerary guide below could already give you a great introduction to the wonders that this destination holds — and that hopefully, the next time you’ll come over, you would be inspired to allot more days in order to fully explore it all! » Start the morning right! There is a dizzying number of Bangkok hotels that you can choose from — BUT, if you want to stay in an accommodation that’s in a prime location, then I would highly recommend that you stay in Sheraton Grande Sukhumvit! Smacked right in the heart the bustling Sukhumvit Road, you will find that almost ALL of the best things that the city are just “steps away” from the hotel. After all, Sheraton Grande Sukhumvit easily links to the BTS Asok SkyTrain and MRT Sukhumvit stations, thereby bringing you to some of the top historical spots in Bangkok in just minutes. The grand shopping hubs such as Terminal 21, Chatuchak Weekend Market, and Emporium among many others are not too far away either! To start your morning on an even better note, you should enjoy a hearty breakfast in the hotel’s tropical poolside oasis and Thai-styled restaurant: the Sala. RECOMMENDATION: Order their Nahm Dok Anchan or Butterfly Pea Drink. It’s a caffeine-free herbal tea in a deep blue color that’s served with a small cup of lemon juice. If you mix this with the tea, the color will magically turn to purple! You could certainly do your own Bangkok itinerary by deriving ideas from the activities that I will later discuss in this post — but given that you’re pressed on time, I think it’s best if you take on a guided tour! Thankfully, Sheraton Grande Sukhumvit has a tour desk at the lower lobby. 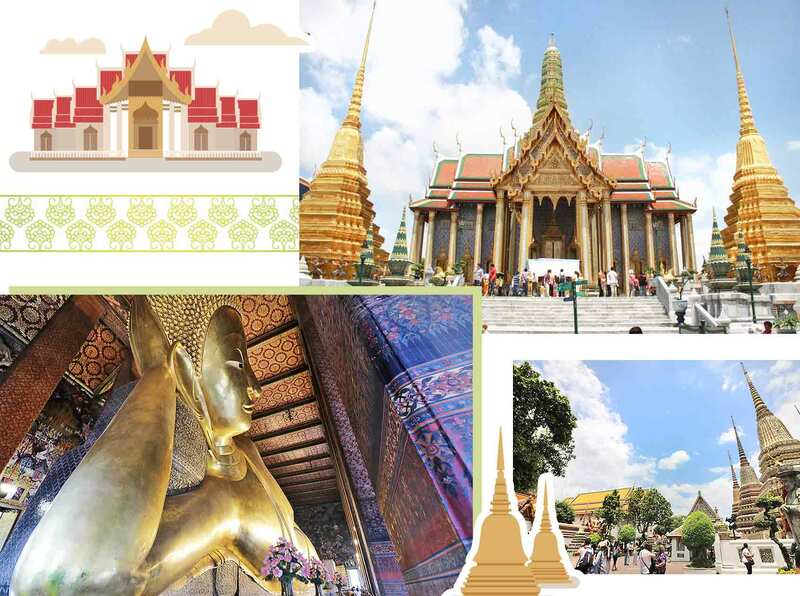 Named as EXO Travel, they offer a range of half and full-day tours in Bangkok in behalf of the hotel. I did their Destination Discovery tour which spanned for a full day and it was the kind of adventure that definitely gave me an amazing ‘glimpse‘ of Bangkok’s popular and hidden gems! (If you want to see the other tours that they offer, go here). Flowing through the city of Bangkok, Chao Phraya (also known as the ‘River of the Kings’) is actually the major river in Thailand so it was and still is an important waterway for the Thai people. 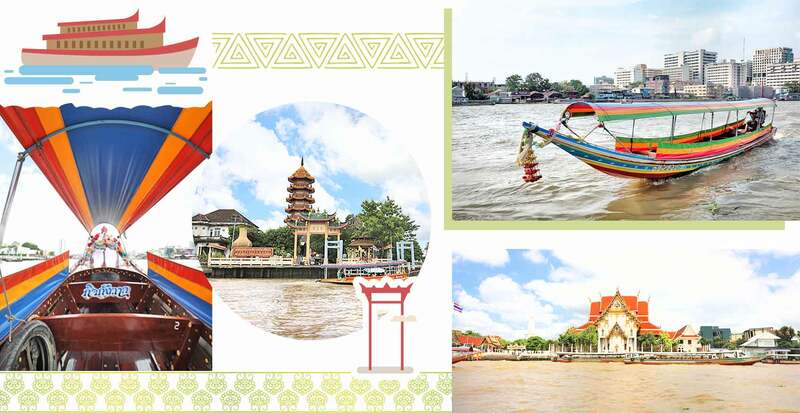 With its location, it surely makes for a great way to go around too, especially because many of the major tourist attractions can be easily accessed from the river via express boats that can range from only ฿10-40 baht. With the Destination Discovery tour, I rather had the chance to go on a private long-tail boat (a native boat used in Thailand) and during the journey, I passed by some of the most noteworthy landmarks on the banks of the river namely: Wat Pho (Temple of the Reclining Buddha), Grand Palace, Wat Phra Kaew (Temple of the Emerald Buddha), and Wat Arun (Temple of Dawn). It was absolutely spectacular to witness these grand structures even if it was from a distance because I truly had the chance to admire them in their entirety! As we were slowly nearing our next destination, we turned into secluded canals (‘klongs‘) where I further witnessed the typical daily scenes of locals in Bangkok. One thing that was interesting to see were the small boats that were cruising through the river, sellings goods to the houses that were on the banks. Apparently, what I saw was a small example of Bangkok’s ‘floating markets’. NOTE: If you want to visit larger and more famous floating markets in Bangkok, choose from the following: Amphawa, Khlong Lat Mayom, Wat Sai, Taling Chan, Damnoen Saduak or Bang Nam Pheung. Together with the United Nations Development Program (UNDP), the Tourism Authority of Thailand, the Bangkok Metropolitan Administration and HiveSters, Sheraton Grande Sukhumvit is participating in the community project called as APPEAR which aims to improve and promote sustainable tourism in Thailand, as well as to share expertise in support of endangered local communities in Bangkok. At the moment, APPEAR supports 6 local communities by helping them preserve their traditions and livelihood through tourism. With that said, as a part of the Destination Discovery tour, you will have the exclusive opportunity to visit one of these 6 local communities, namely Baan Bu (or Ban Bu). 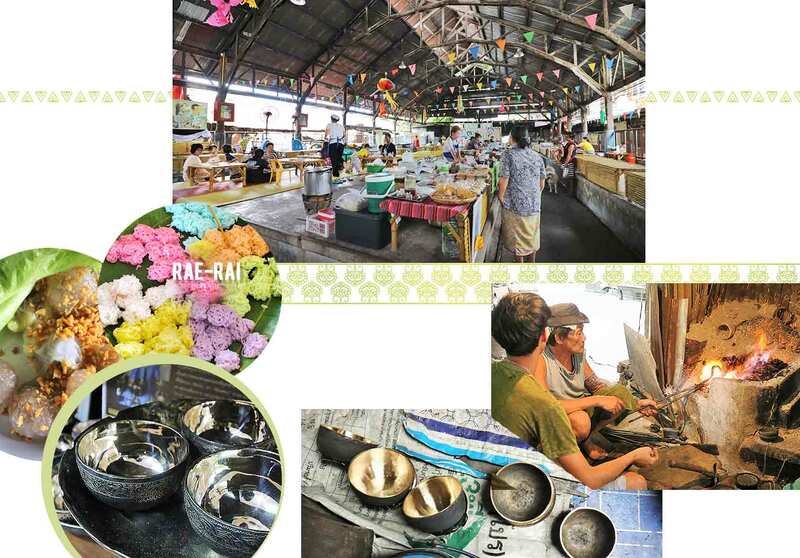 Baan Bu is a community of artisans and expert smiths who are famous for their khan long hin or stone-polished bronze bowls. Today, it is said that the community is an embodiment of Thailand’s traditional neighbourhood given that it has fulfilled Thai society’s fundamental community architectures of temple, market, school, hospital, train station and pharmacy. Sa-Nguan Osot. Ban Bu was once the center of medical treatment via traditional medicine. Nowadays, this is the only remaining traditional pharmacy in the neighborhood and it is owned by Mr. Sa-Nguan Laotrakul. There are a variety of Thai herbal and traditional medicines that you can find here as well as a couple of picturesque vintage wooden medicine cabinets and old medicine grinders. If you’re interested, his famous herbal remedies are Yahom Indrajakra for the heart, Yanin Osot for mouth ulcer, Yahom Sommit Kumarn for children. Jiam Sangsajja Bronze Factory. This is the only remaining establishment in Thailand that still produces the beautiful khan long hin or stone-polished bronzeware — an ancient craftmanship that has been handed down since the Ayutthaya era in the country. It is originally an important utensil that keeps water and food cold, but it has since evolved into a decorative item or collectible. The sad part is that back in the day, there used to be over 100 craftsmen; however, there are now only 2 professionals that are working inside the factory that is owned by Ms. Khun Metta Selanon. The professional craftsmen are about 60 years old and passing the knowledge proves to be a bit hard because not only is the process meticulous but there are not enough young people who are willing to learn the craft. There are about 6 steps involved in making khan long hin: heating, shaping, smoothing, filling, polishing, and shining. It was very interesting to watch the overall process inside the factory and I believe that the toughest step is the first because heating the alloy involves a lot of skill and effort in order to beat it into shape. (TRIVIA: This process has inspired the name of the community, ‘Bu‘). Prices of khan long hin start from ฿ 800 baht to ฿ 20,000 baht, depending on the size. Thonburi Locomotive Depot. Near Baan Bu and also not too far from the train station is this depot where you can find Thailand’s last 5 steam engines. They are kept here and maintained, but some of the steam locomotives are still active and even serve as special trains on important occasions for the State Railway of Thailand (such as the King’s birthday in December). Grand Palace. For about 150 years, this place was not only the home of the King and his court, but also the entire administrative seat of the government. By the turn of the 20th century, Thai Kings have stopped living in this palace and has primarily became a public museum; yet the complex remains to be the seat of power as well as the heart of the Thai kingdom with several royal offices still situated inside. Take note that unless there is a state function, the Grand Palace is open everyday from 8:30AM to 3:30PM (audience halls with the magnificent thrones are closed on weekends). Wat Pho. Known also as the Temple of the Reclining Buddha, Wat Pho’s official name is Wat Phra Chetuphon Vimolmangklararm Rajwaramahaviharn. This temple is 1st on the list of 6 temples in Thailand that have been given the honor of being the highest grade of the first-class royal temples. In here, you can find the largest collection of Buddha images in Thailand, including a 46-meter long reclining Buddha (depicting Buddha’s pose at death when he entered Nirvana). To enter the temple, you must wear proper clothing (no exposed shoulders or skin above the knee) and you must also take your shoes off. If you desire so, you can also purchase a bowl of coins at the entrance hall and you can drop them in the 108 bronze bowls that line the length of the wall. At the end, you can make a wish and receive good fortune (otherwise, the money will help the monks as well as help preserve Wat Pho). Apparently, 108 is a significant number as it refers to the 108 positive actions and symbols that helped lead Buddha to perfection. Aside from the reclining Buddha, the temple grounds also contain a number of viharas (halls), 91 small chedis (stupas), 4 great chedis, 2 belfries, a bot (central shrine), gardens, a small temple museum, and other buildings — notable of which is the school of Thai medicine which is famous for being the birthplace of traditional Thai massage and for being the national headquarters for the teaching and preservation of such traditional practices. Truth be told a lot of people desire to either be taught here or to be serviced a massage (it can be quite tough to reserve a spot). » Stuff yourself with great Thai food for lunch! If there is one place that you must dine in when in Bangkok, it would be the humble restaurant of Krua Apsorn in Samsen Road! It is a favorite among the locals and it remains to be a legendary ‘heritage’ restaurant in the city that consistently delivers delicious Thai dishes in affordable prices. This was our lunch stop during the Destination Discovery tour and I’m so glad that they introduced me to this place. Besides, every dish that was served to us was bursting with bold flavors that made me want for more! The restaurant is famous for its crab dishes (especially the crab omelette); anyhow, the classic Thai cuisine fares such as Tom Yum Goong, Pad Thai, and sticky rice were already to die for. TRIVIA: Krua Apsorn originally rose to fame when the owner, Chef Chanchavee Skulkant, was chosen to cook a meal for some of the members of the Thai Royal family. They enjoyed it so much that she ended up working for the mother of the King and for her daughter too! Jim Thompson House. James Harrison Wilson Thompson was an American businessman who helped save the Thai silk industry from extinction in the 50s and 60s. As a highly-gifted designer and textile colorist, he is said to have contributed substantially (or “almost single-handedly” aided) to the industry’s growth and the worldwide recognition of Thai silk. Without a doubt, Jim really loved Thailand, that’s why whilst he lived in the country, his famous Thai house was built in a way that adhered to the old local customs. And if you visit this complex in Bangkok, you will be taken on a tour through the 6 teak buildings (in which most are at least 2 centuries old) as you get to witness more of the traditional Thai architecture — and also the ‘design tastes’ of Jim himself. In 1967, he mysteriously disappeared from the Cameron Highlands in Malaysia. At this time, he was one of the most famous Americans living in Asia and so, the search became one of the largest and searches in Southeast Asian history, and is one of the most famous mysteries in Thailand. 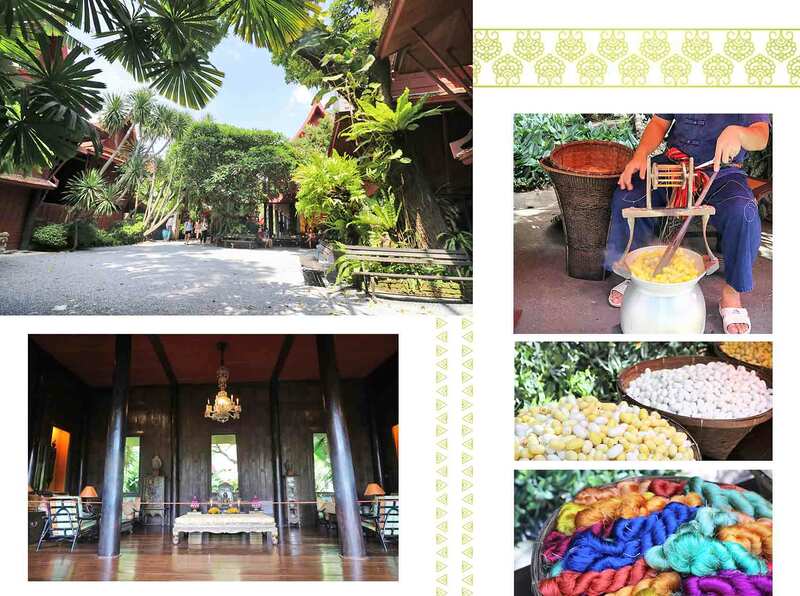 His house now serves as a museum and a lasting reminder of his creative ability, his contribution to the silk industry, and his love for Thailand. OTHER SUGGESTIONS: If you’re going to explore Bangkok on your own and opt to not take this tour, the other places that you can explore are the following: Wat Phra Kaew (Temple of the Emerald Buddha), Wat Arun (Temple of Dawn), Wat Traimit (Temple of the Golden Buddha) and/or Wat Saket (The Glden Mount). If you’re up for a unique dining experience, I would suggest that you book yourself into ‘DID’ (Dine in the Dark). As the name implies, you’ll be dining in the dark and this whole ‘dark dining’ concept will basically entail eating in total darkness whilst you are served by visually-impaired guides. I went through this experience myself and though it was unsettling at first, it ended up to be quite an incredibly fun night! To add, the ‘removal’ of my vision truly heightened the rest of my senses as I feasted on their 4-course menu. If you want a more detailed explanation about this, you can read about my experience below. 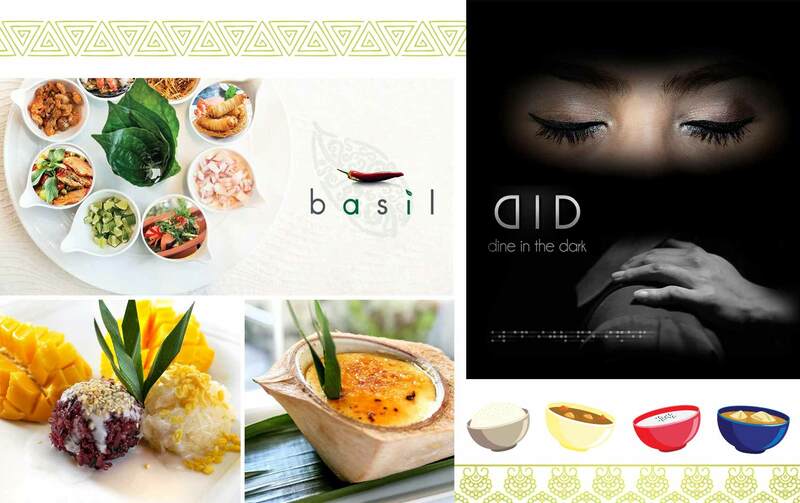 However, if you still haven’t had enough of Thai cuisine, you could also dine in Sheraton Grande Sukhumvit’s award-winning Thai restaurant: basil! This restaurant features authentic and refreshing dishes that are inspired by Thailand’s North (Chiang Mai), North-East (Isan), Central (Bangkok) and South (Phuket) regions. Some of the things that you should NOT miss? Definitely their Koy Tuna, Tom Yum Goong and Coconut Crème Brulée — they were my absolute favorites! 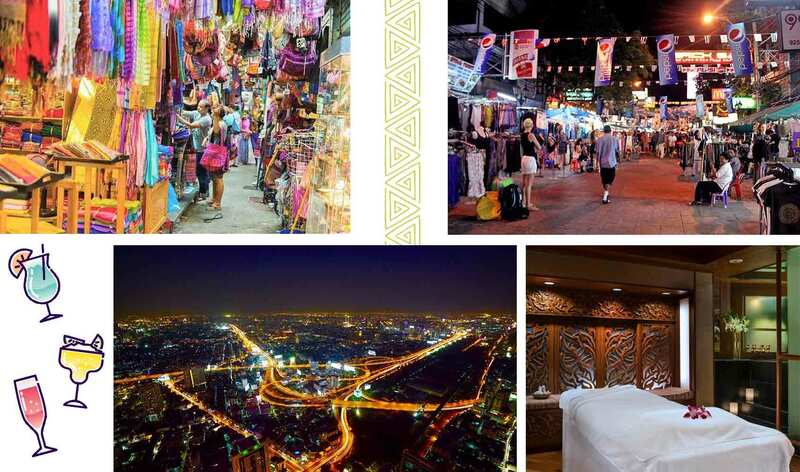 Bangkok is a treasure trove of adventures so there’s always ‘something’ for everyone. To end the day, feel free to choose from ANY of the activities below and you’re sure to have a memorable time! Bars & live music. You must have surely heard of Bangkok’s famous nightlife scene. For sure, you can find various types of bars and clubs around the city! Come pick your poison at: Khao San Road for the ultimate ‘backpacker’ party hub, RCA (Royal City Avenue) for the most popular clubbing hotspot, Sukhumvit for the young local clubbing scene, or Silom Road for a mix of everything. NOTE: Chatuchak is open from 6AM to 6PM with Saturday and Sunday for miscellanous, Friday for wholesales, and Wednesday to Thursday for plants and flowers. It’s rather best to go during Saturday and Sunday if you ask me because that’s when most shops are open. Night markets. You must NEVER leave Bangkok without stopping at a night market! They are spread out in most areas of the city and they offer a superb range of bargain goods, food, and entertainment. Examples of these amazing night markets (other than Chatuchak and Khao San) are: Rot Fai in Srinakarin for being the biggest, Rot Fai in Ratchada if you want something closer, JJ Green for flea markets, Patpong for fake brands, Pratunam for various things, or Asiatique for a more shipping-mall kind of atmoshphere. Thai Massage. Yet another must-do. If you didn’t manage to experience an authentic Thai massage at the famous Wat Pho, there are tons of other places to choose from in the city; but since the night is about to wane down, why not have it at the hotel? Sheraton Grande Sukhumvit has a ‘Grande Spa’ that offers an array of spa services. With that, you must try absolutely their Traditional Thai Massage! But if you want a whole pampering package, I would recommend the ‘Traveler’s Pampering’ day-long experiences. Where to get the best flights deals to Bangkok? My go-to platforms for grabbing the best flight deals are Momondo and Skyscanner. But of course, it’s always good practice to first research the budget airlines that exist in the country that you’re currently staying in because they could have rock-bottom prices that are not often visible in the above flight search engines. (For example, in the Philippines, budget airlines like Cebu Pacific and AirAsia have great deals and promos that often set ticket prices at just about $1!). Bangkok has 2 airports namely Suvarnabhumi Airport and Don Muang Airport, with the latter being older. They’re both over 30km away from the city center; rest assured, if you have to transfer from one airport to another, there are free shuttles for you to use. For Suvarnabhumi, you can reach the center of Bangkok via a taxi (about 250 to 400 baht), a bus (through BMTA for 50 baht), or the Airport Rail Link (for 45 baht). As for Don Muang, there are taxi options (at roughly 250 baht), train (starting at 20 baht), and bus (30 baht). 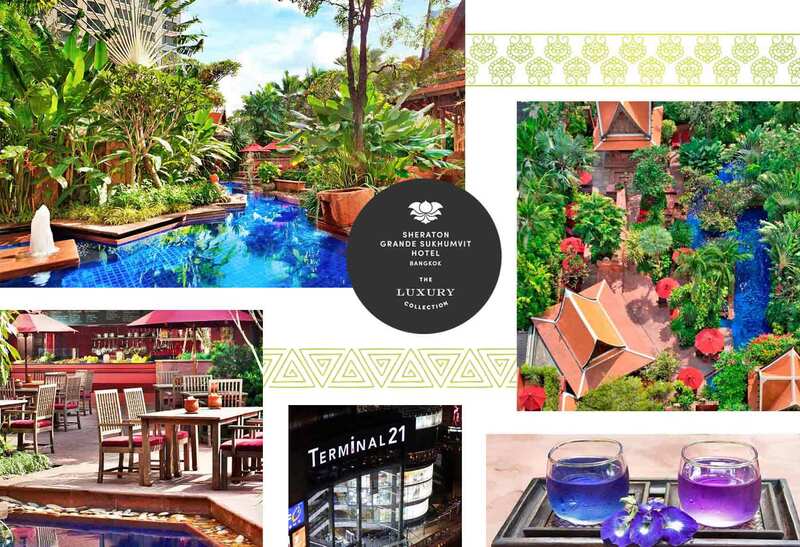 What are the best accommodation choices in Bangkok? How can I go around Bangkok? Bangkok is well-connected when it comes to public transportation especially with the existence of BTS Skytrain, MRT trains, express boats, buses, tuk-tuks, and others. For a detailed guide on how to get around Bangkok, read here. Should I get a visa to visit Thailand? If you’re NOT a citizen of any of Thailand’s exempted countries, you are then required to avail a visa beforehand (or you can also get a exempted). If you’re from the Philippines, you can enter Thailand with just your passport and you can stay up to 30 days if entering via an international airport (or 15 days if entering through a land border checkpoint from a neighboring country such as Laos, Myanmar and Cambodia). Is there someone here who speaks English? : Tee-nee-mee krai poot-pa-sa Angrit dai-bang? Wanna see a glimpse of how this 24-hour visit looks like? Watch my Bangkok vlog/video below starting at time stamp 4:02! Depending on your travel style or preferences, do feel free to tweak (DIY) the above itinerary to your fancy by using some of my other tips as substitutes or whatnot. All in all, I hope this 24-hour / one-day itinerary will help give you a memorable time in the amazing city of Bangkok! Enjoy! What do you think of this 24-hour Bangkok itinerary? What activities above would you like to try out the most? Since then, I revisited Bangkok a couple of times and can never get enough of the amazing street food, YUM! Oh no, I'm sorry to hear that! But I'm happy to hear still that you loved Bangkok and revisited several times :D I personally wish to go back there again! It is a very interesting and colorful blog post. This DIY itinerary seems very convenient if we have only one day to spend in Bangkok. In a short period of time, we can discover the country through its traditions and landmarks. 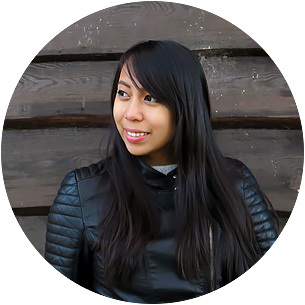 Your blog is very informative, you make a proper of visuals to illustrate your posts making them very lively. It therefore, encourages tourists to go there and travelers to subscribe your blog for more insights. I really appreciated that after each proposed activity you put some tips. We can feel that it is your own experience and you did not copy from somewhere else. Another good aspect of this itinerary is that you suggest what to do from breakfast till midnight. This includes opening hours of night clubs which is practical when you are visiting the country for the first time. It is a very good post where local Thai food and traditions were promoted. It is different from other travel blogs I read and the pre-travel guide is something which any tourist needs before travelling. I wish you more success and keep it up as you are gifted to be a good travel blogger. I'm very happy to hear this, Anaelle! Thank you so much! I really tried my best in providing as much info as I can. Hope it helps you too in the future! Thank you for this amazing guide. I'm going to Thailand in January, it's going to be my first time in Asia so I gather all possible information I can... :) I can't wait to try the Thai cuisine, I've heard so much about it already. I noted the place you recommend and I am totally visiting it! Oh, I've dined in the dark in Poland, it was an interesting experience... but I don't think I want to repeat it, I needed a lot of time to get used to this complete darkness and to feel comfortable there. Wooo ! It looks like a very colorful and tasteful destination ! Ah, you just reminded me that I need to visit South America soon too! Let me know when you do get over to Bangkok. You'll love it there! I've been to Bangkok twice and really love it there. I've never taken the boat though and would love to see the boat market. I'll check out your other suggestions as well especially the Dine in the Dark. wow! Looks like you got a lot done in such a short time! I really would have loved to go to that marketplace. It looks amazing. I like going into local scenes for sure because it feels like the touristy things don't really give you a real feel for the culture itself. These are great pictures! Thank you for sharing! Wow. This looks amazing!! It would be super busy but if you only had one day what a great way to see and experience so much! I have always wanted to go to Bangkok. Hopefully one day we will and I really hope it is for longer than a day!